Rugby is a team sport that delivers significant social and health benefits. It can also be a physically demanding sport and players should be physically and mentally prepared, and understand how to play safely. It is the responsibility of all - players, coaches and parents - to ensure that a positive, safe, enjoyable environment is created where ALL players will be able to reach their fullest potential, and that – whatever form of the game you play - the training and education materials and equipment are there to support everyone in creating that environment. Touch rugby is widely played as a training activity for rugby union and as a non-contact variant in schools and junior clubs, and as an informal social sport in leagues or tournaments. Each team of six players attacks the other team's try-line and keeps the ball for a total of six 'touches' (tackles). At the end of these six touches, if the team has not scored possession passes to the opposition. 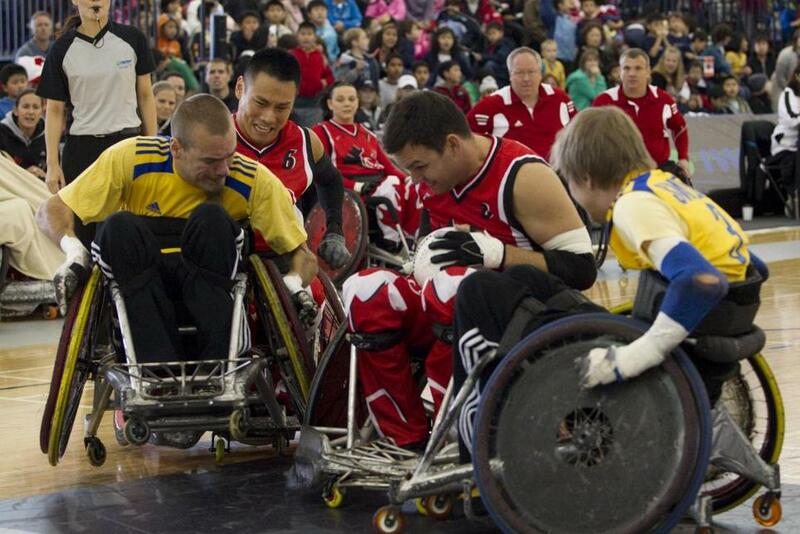 Wheelchair Rugby is a mixed team sport for male and female quadriplegic athletes invented in Winnipeg, Canada in 1977. It combines elements of rugby, basketball and handball. Players compete in teams of four to carry the ball across the opposing team's goal line. Contact between wheelchairs is permitted, and is in fact an integral part of the sport as players use their chairs to block and hold opponents. Wheelchair Rugby is a Paralympic Sport currently played in more than 40 countries and presided over by the IWRF [link], which includes three zones: the Americas, with six active countries; Europe, with 14 active countries; and Asia-Oceania, with six active countries. Rugby Sevens is now an Olympic sport which will be played at the 2016 and 2020 Olympic Games in Rio and Tokyo. ‘Sevens’ is played increasingly at the grass roots level, but at the elite end of the game are the (men’s) HSBC Sevens World Series and (women’s) World Rugby Women’s Sevens Series for national teams, both of which are staged in multiple countries around the world, like a grand prix format. Both are also direct qualifying tournaments for the 2016 Olympic Games, with the top four-ranked nations in 2014/15 booking their place in Rio. Because Sevens is played on a full-sized rugby pitch but with less than half the normal number of players (seven against seven, instead of 15 against 15), there is a large amount of space to run in. This makes it a very fast and exciting variation of the game demanding huge levels of fitness. In 12-a-side rugby a ‘number 8’ (hindmost player in the scrum) and a full-back are further added as another step in the progression from 7-a-side to 15-a-side. This variation can be useful to a coach who has a squad of 16 or 17 players. With a number 8, the players can be introduced to the idea of having a back row player to provide, for the first time, a link between the forwards and backs. In the traditional form of the game, players are introduced to the full game of Rugby, the core of the sport. Now they can enjoy all the intricacies of the game and try out different positions in the team. Depending on factors such as age and experience, a player may play in several positions before they settle in one that suits best, and coaches should be prepared to allow this. Hopefully, other clubs nearby will be able to offer fixtures and the steps outlined below offer advice about how to arrange a league.